Loryn: Craft Challenge Three ended today, and we have a lot of fun projects to present! When I craft, I usually think in terms of functional, rather than decorative, objects. This craft challenge was no different. I started out with the idea of making an organizer with compartments, and I decided to use plastic bottles. I raided the recycling bin at work and got to work cutting up water bottles. My first thought was to cut the bottoms off and staple them together to make a drawer organizer, but most of my drawers have too many items of different sizes for it to be really useful. 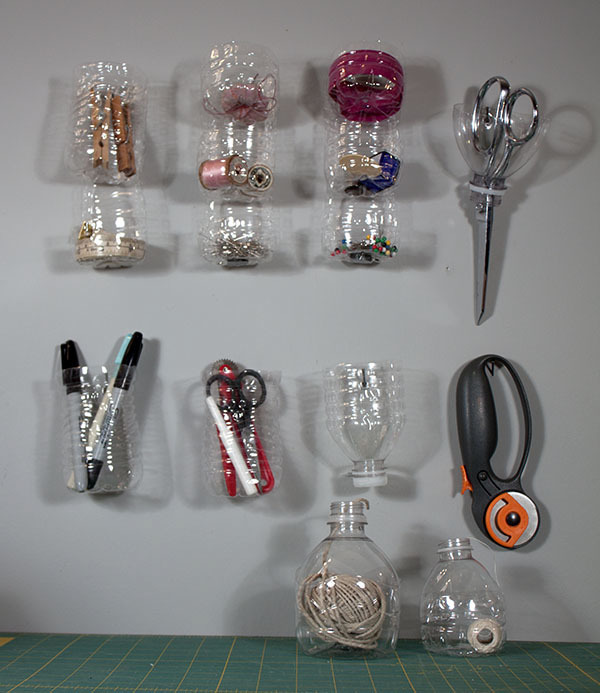 Then I started thinking about a wall-mounted system for my craft table. 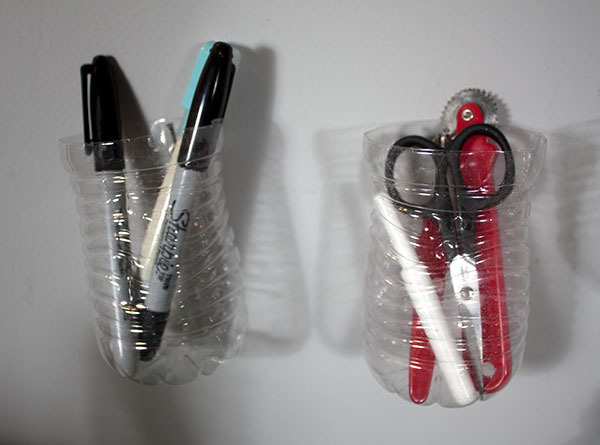 I cut the water bottles into various sizes and used grommets to hang them on nails. 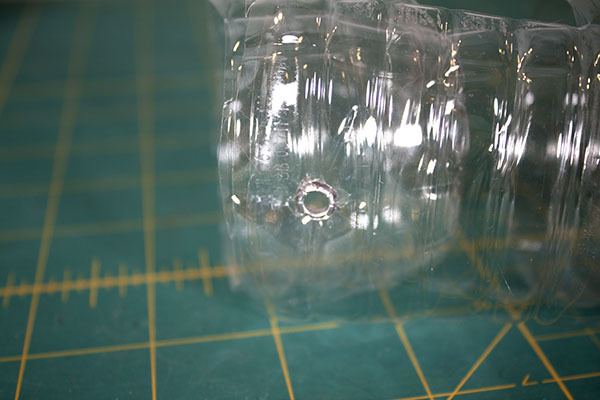 The grommets keep the plastic from ripping.. 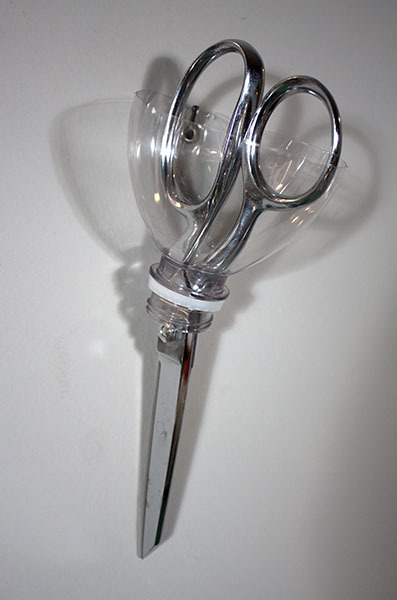 This scissors holder was a last-minute idea, but it may be the one that I like the most. 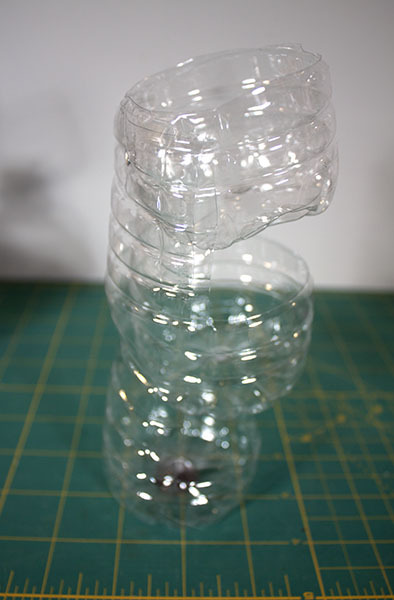 This is a three-tier holder, made by cutting three bottles. I left a long tab one third the circumference of the bottle as a hanger. On the longest tier, the tab is nearly as long as the bottle. The tab on the middle tier is half the length of the bottle, and the top tier is just the bottom. I used the hanging grommet to hold the three tiers together. The organizers are very lightweight, so I put a strong magnet into the round indentation at the bottom of the bottle to hold pins. It’s held in place with packing tape. This is a two-tier holder. The bottom tier is made just like the one on the three-tier holder, and the top tier is half of a bottle. After doing the multi-tier organizers, I decided I wanted a couple simple pencil cups. Here you can see the tiers in side view. Here you can see the grommets that hold the tiers together. I used a sharp yarn needle to poke a hole in each layer, then a larger upholstery needle to enlarge the hole. Then I threaded all three onto the grommet and used a small piece of scrap wood inside the grommet as a hammering surface to fasten the grommet. 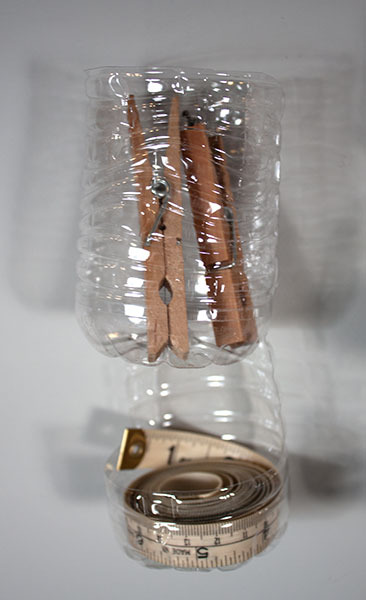 I also made two string holders by cutting the top and bottle of bottles off and fitting them together, and I used the top of a bottle as a funnel. 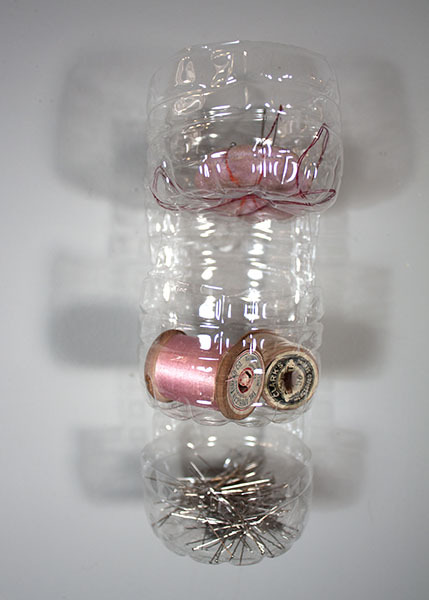 There are a lot of possibilities with all of the different plastic bottles out there! 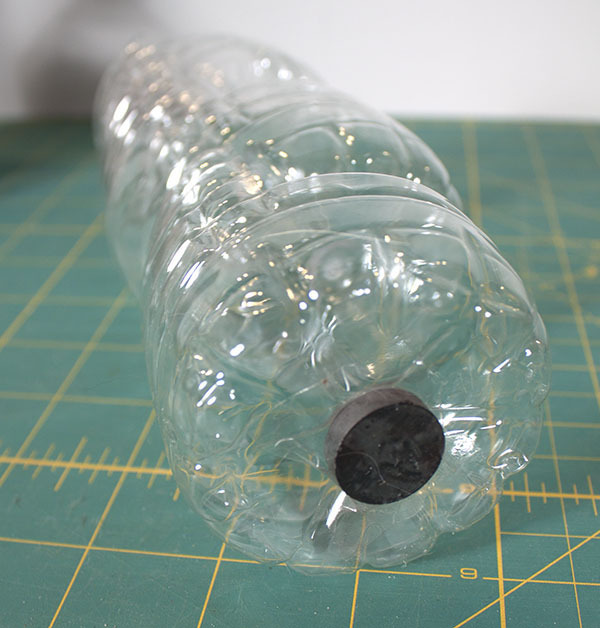 Pingback: 13 Creative Plastic Bottle Projects!